Use your computer's utilities for navigating the local file system on your computer. Navigate the World Wide Web. Start programs and applications including how to install programs. Mouse skills: single click, double click, left click, right click, click and drag. Use scroll bars to view different parts of documents. Use your Web browser's security features especially concerning pop-up windows. Pop-ups need to be enabled to view the results of many KGS data searches. If you need help with these skills, visit your local library. Most community or adult education programs offer free resources. Books like The Internet for Dummies , Windows XP for Dummies , and other references are available. don't forget that the help files supplied with operating systems and Web browsers also has key information. The KGS sites use pop-up windows. Enable pop-up windows for kgsmap.uky.edu and kgsweb.uky.edu. Internet Explorer 7: Tools | Pop-up Blocker | Pop-up Blocker Settings, then add the two URL's. If the Pop-up Blocker Settings choice is gray, your pop-up blocker is not on. Firefox: Tools | Options, on Content tab, click the Exceptions button opposite the block pop-up windows option and add the URL. Depending on how you have Firefox configured, you may not see the Tools command. If you don't see the menu bar with the Tools command, press F10 to toggle it on. You must install the free DjVu web browser plug-in to view scanned images of oil and gas well records. Links are provided on most of the search pages. Visit the Download DjVu Plug-in page. Note that DjVu is distributed through agreement with Cuminas. Choose the correct DjVu product (pay special attention to the Windows or MacOS X versions) to download the installation file. Download the file to your desktop or Downloads folder. Double click on the installation file icon to execute the program and complete the installation. You only have to do this once. From the main KGS Web site ( www.uky.edu/KGS ), access to the oil and gas data search services are provided in the Quick Links menu. Click Oil & Gas Information to access choices for oil and gas well data searches. For a criteria-based search of oil and gas well data, click Search oil & gas wells to access oil and gas data services. Search for Oil & Gas Well Records: the interactive search service (see following ). Oil & Gas Map Service: direct link to the interactive mapping service with the petroleum geology map layout selected (see following ). Oil & Gas Permitting Visualizations: a set of interactive maps for exploring permits issued during a year. Click Coordinate Conversion Service to convert between the various datums and projections used in Kentucky including Carter coordinates. KGS Databases, Maps, and Publications (http://kgs.uky.edu/kgsweb/main.asp ) is the main access point to multiple interactive map and data services. The KGSGeoPortal is a link to a variety of Kentucky-based GIS themes and services hosted on many state and local servers. The Kentucky Geography Network provides access to maps and downloadable themes and services provided by the State of Kentucky including The Commonwealth Map . Search methods. Options are selected by scrolling through the menus or clicking the menu selector button to reveal the pull-down menu of criteria choices. When instructed to pick a method, county, quadrangle, or others, click this tool to see the choices. This tutorial will illustrate a well search by topographic quadrangle. Search entire database (default): This method includes all wells in the database for the search. It is usually used to monitor recent activity when combined with the choices to limit the search by completion date or date the permit was issued. You must specify one or more limits or your search results will be truncated. To download a database of all oil and gas wells in Kentucky that have a valid location, see the well location shape file. Search by 1:24,000 Quadrangle : Pick USGS 7.5-minute topographic quadrangle name from a list. Depress the control key and click to select multiple quadrangle names. Search by County: Pick the Kentucky county name from a list. Depress the control key and click to select multiple county names. ADVANCED: Radius Search (lat/long coordinates): Find all wells within a specified distance from a location you select using degrees, minutes, and seconds of latitude and longitude. ADVANCED: Radius Search (decimal degree coordinates): Find all wells within a specified distance from a location you select using decimal degrees of latitude and longitude. Search by Plat/Permit Number: Find one well if you know the permit number. Permits are issued by the Division of Oil and Gas and may contain letters. Do not include dashes or blanks when entering a permit. Information on Kentucky permits is available in the FAQ. Search by KGS Record Number: Find one well if you know the unique serial number assigned to the well by the KGS. This number is used by the Survey to tie all the data (including images) for a well together. Unless you have purchased digital data from the Survey or downloaded the current ArcView shape file, you probably don't have this number. Set Search Limits. If appropriate, filter or limit the number of wells to be found by choosing one or more of the limiting conditions. Click the link or the menu open icon (box with "+") to expand the limit options. Multiple limits can be used in a single search. For example, criteria can be specified to select only producing wells with electric logs in a specified area. Remember that only wells that meet ALL the conditions you specify will be returned. If you get stuck, use the Reset and Reset form buttons to clear the criteria and start over. Limit by Operator and/or Farm Name: Find wells drilled by a particular company or on a specified lease. Both operator and farm name can be specified. Limit by completion result: Find wells with selected completions (oil, gas, etc.). This selection includes an option to exclude locations with expired or cancelled permits known as "terminations." Limit by basin : Confine your search to statistical regions of Kentucky, eastern, central, western, or the Jackson Purchase. Limit by date will select wells within specified date ranges. ONLY wells drilled within the PAST YEAR of Today will return wells a completion date within the previous 365 days. When this option is enabled, the query does not return recently permitted wells for which no completion date is available. Records with Scanned Documents (DjVu Files limits search to only those wells that have scanned images available. Records with PRODUCTION DATA monthly oil and gas production data are now reported to the Kentucky Division of Oil and Gas. Monthly data by county are available at the Division web site in the Oil & Production Reports Library . Records with Formation Tops Data limits search to wells with stratigraphic tops information. See the FAQ for a key to the formation codes. Records with COMPLETION DATA will select wells on which drilling records are available. Expired or cancelled permits, recently issued permits, and tight holes for which no data other than location are available will be dropped from the well list returned by the search. Records with PAY DATA will select producing wells, secondary recovery wells, gas storage wells, and others with reported completion intervals. The pay data are accessed by clicking the Pay Data Report link on the search results page. Records with SAMPLES will select wells with cuttings or cores on file at the Kentucky Well Sample and Core Library. A separate cutting and core data search is also available. Records with CORE will select wells with cores (only) on file at the Kentucky Well Sample and Core Library. A separate cutting and core data search is also available. Limit by E-Log will limit the returned results by the availability of wireline (electric, geophysical) logs. The default is to not limit the search by this criteria. For more information see What is an electric log (mud log, geophysical log, or others)? Records with ANY E-LOGS will limit search to those wells with any electrical or geophysical logs on file regardless of whether it is scanned or not. Do not limit by E-LOGS (default) This choice is automatically selected and when active, the search will ingore the availability of E-logs. Limit by Depth: use these options to limit your search by depth. The default is not to limit the search results by well depths. Cambrian and deeper wells will limit search to those wells that penetrate into the Cambrian (usually Copper Ridge Dolomite) and deeper units in a specified area. Wells with a depth greater than or equal to: ______ FEET will limit search to those wells with a total depth of at least the specified footage. Do not limit by depth (default) This choice is automatically selected and when active, the search will ingore the depth of the wells. Limit by Well Deviation Type, wells can be standard vertical wells or can be purposefully deviated to reach targets not directly below the surface location. The default is not to limit the search results to a specific well geometry. Note that multiple deviated well bores can be drilled from the same surface location to various target locations. only horizontal deviated wells will limit the results to wells with one or more horizontal "laterals"
Once you have selected your criteria, click the "Search for oil and gas wells" button to display a table of wells that match your requested area and criteria. Take note of the total wells and total pages returned by the search; the information is displayed in the upper left of the results screen. To navigate multiple pages, a list of links to the first, previous, next, and last page is provided at both the top and bottom left of the data table. In the search results table for each well, click the "View Records" link to display the disclaimer and thumbnail index of available records. If this doesn't work, try re-installing DjVu. If that doesn't work, try rebooting your computer. If you have any questions, read the trouble shooting guide. Click on a thumbnail to view an image. Close the image window to return to the list of wells. Full size tiff images of geophysical logs and LAS files (where available) may be downloaded, click the Elog download link in the yellow highlighted area. If there is no yellow highlight and no link, there no logs are available for viewing or downloading. Upload to GPS is a service that provides direct upload of well location data to a Garmin GPS receiver. The Garmin Communicator plugin is required to send the location data to an attached GPS device. If you don't have a Garmin, download and save the GPX file then import the location data to your device using its native desktop software. Zoom and pan tools (the magnifying glasses and the hand) are available to magnify and reposition the map. Use the menu on the right to display a map legend, select a map layout (Petrolem Geology Map), and change the visible map features. If you change map features, click the Update Map button at the bottom of the features list or click the icon of the arrows chasing each other. Use the "identify" tool (the black dot with a white letter "i") to click on a well and display information about it in a list at the bottom of the page. Use the "select by area" tool (the dashed rectangle with an arrow) to highlight wells in an area. A list of the selected wells will be displayed that can be highlighted, copied, and downloaded into a spreadsheet program, see the link at the bottom of the table. A georeferenced map image may be saved using the download the map image tool (disk with red arrow pointing to it). The map may be printed with the "Print this map icon". Data may be downloaded as a semicolon or tab delimited ASCII text file or directly to a Microsoft Excel format file (*.xls). To start the download, click the "download all oilgas results" link. Select the datum (NAD27 or NAD83) and coordinate projection for the data you want to download. The default is NAD27, geographic coordinates (decimal degrees of latitude and longitude). You must remember this if you want to import the data into any mapping software. Select the download type: semicolon delimited ASCII text, tab delimited ASCII text, or Microsoft Excel format. The ASCII text files will have a file type of *.kgs. This is done to force most browsers to prompt you whether you want to open or save the file. The text files can be opened and viewed using Notepad, Word, or Excel (text import). Your browser should open a new dialog box that requests you choose whether to save or open a file. If you selected an Excel format file, Excel should automatically open. Note that the file type of kgs was chosen to force most browsers to open the dialog box. If you have associated files of type txt or kgs (and others) with Notepad, the file will open automatically. Simply use the File | Save As menu command in Notepad to save the file. KGS Geologic Map Service (http://kgs.uky.edu/kgsmap/kgsgeoserver/viewer.asp): search the oil and gas data using an interactive map. 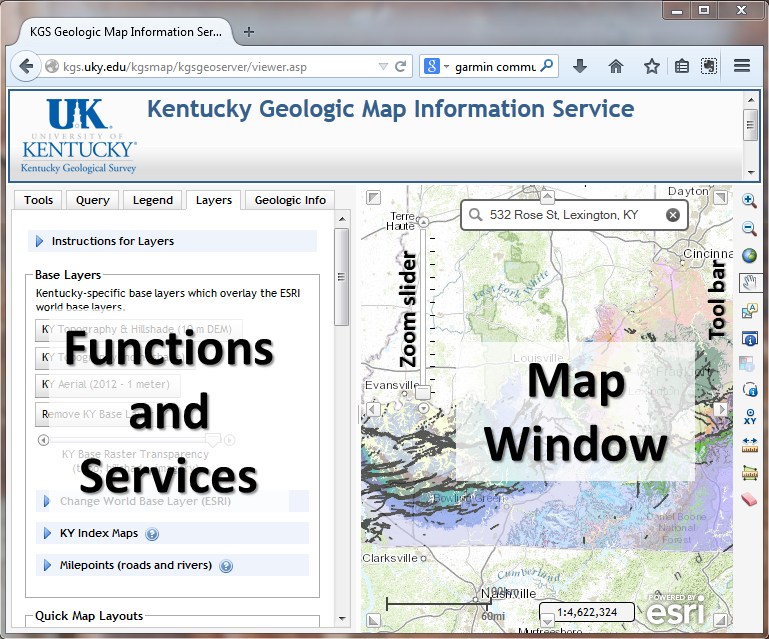 This service includes access to Kentucky's digital surface geologic maps, coal and water data, georeferenced photographs, and other spatially related data. Map tools are provided in the menu of functions and services on the left and with the toolbar on the right. In general, click a tool to make it the active tool; it will be highlighted by a box. Clicking on a map feature or clicking and dragging will execute the requested action. Mouse over the icons to view a tip on the function of each tool. Zoom in on an area. The zoom-in tool is the magnifying glass with a plus sign in the tool bar on the right); click and drag a box to zoom in on an area. Or, use the Zoom to a Location dialog (available on the Tools tab in the menu of functions and services) to quickly locate counties, places, streams, highways, topos, and others. A geocoded address search is also provided, see the dialog box at the top of the map window. Click the search button to execute the zoom task. Use the identify tools to get additional information including the unit descriptions from the original 1:24,000-scale geologic quadrangle map. Some tools work on for only a selected point, Other tools are available to identify features in areas you select. Map size and scale are fixed and can't be set by the user to specific values. Use your desktop GIS software with available data sets to produce maps of select areas at specific scales. Click the Legend tab to see a legend for displayed features. Click the Layers tab to see a list of available features. Click the check box next to a theme to enable or disable the features (if grayed out, the feature isn't available at the current scale). Layers and features that include a red arrow and external drive icon can be downloaded by clicking the icon. Example 1 : Find the deeper wells drilled in Carter coordinate M-87 of Pike County since 1/1/2000 for which scanned images of elogs are available. Set the search method to Search by Carter Coordinates. In the dialog boxes, select M as the 5-minute letter and 87 as the 5-minute number. For this example, ignore the 1-minute section number. Scroll down and click the check box to limit the search by completion date. Change the operator to Younger and set the date to 1/1/2000. Scroll down and click the check box to limit the search to records with SCANNED E-LOGS. Scroll down and click the check box to limit the search to wells with a depth greater than or equal to: and enter 5000 into the dialog box. Click the SEARCH FOR OIL & GAS WELLS button to submit the search request. The data are returned in a table that provides access to scanned well record data, production data, maps, and more. Example 2 : I inherited land from grandfather near Boldman in eastern Kentucky. A company has approached me about leasing the oil and gas. Is there any gas on my property? Click the zoom to a location service on the Tools tab to open that dialog. Change the geographic area type (for searching) to Place Names and enter Boldman in the dialog box. Click the search entered place name button. When the geologic map is displayed, click the Petroleum Geology Map layout to see oil and gas wells. Change the map scale or use the zoom tools to change the extent of the map. Use the area selection tool (red dashed rectangle with arrow pointing in) to click and drag a box around an area. Click on the record number link to see data for an individual well or click on the link at the bottom of the table to click to view/download more info for all these oil and gas records. In the customize map menu showing the layer list, enable the Photo Locations layer and update the map (chasing arrows icon or update map button). Example 3: You downloaded a *.kgs file from the search pages. How do you import the downloaded ASCII text file into Excel? Navigate to the folder where the file oilgas_mmddyyyy_nnnn.kgs was stored; usually this is the desktop or downloads folder. The name of the file you downloaded will be unique and based on the current date (mmddyyyy) and a control number (nnnn). Set the Files of Type dialog to All Files. Select the downloaded file from the list of files. Click the Open button. The first step of the Text Import Wizard should start. The file is "Delimited". Click Next. In the list of delimiters, select the semicolon (or tab). Click Next. Scroll right to find the permit_number field. Click in the column heading that says "General" to select the column. Set the column data format for the permit_number field to be "text". Click Finish. Last modified May 19, 2014 .